It’s been quite some time since my last Tuesday Tattles post, and today’s is a very special edition. My little man is now ONE! Today I will share with you the planning (and execution) of his birthday party. I will post another Tuesday Tattles next week documenting our favorite products to date. Before I get into the decorative and food details, I need to give a HUGE thank you to my parents for allowing us to have his party at their summer home in Wisconsin. (I spent my childhood Fourth of Julys there when it was my grandparents’ home and I knew that living in Ohio we’d be close enough to spend the holiday weekend there once again. It just so happened that the little man shares his birthday weekend with America.) And another huge thank you to my in-laws for agreeing to travel from Alabama for the little man’s first birthday. Being surrounded by family, the invite list grew and grew and this birthday party became bigger than I envisioned for a first birthday. Thankfully the weather was perfect and our outdoor gathering was a wonderful reunion. I think my favorite part about the party was that my cousins’ kids, ranging from ages 3 – 17, absolutely loved my son – and better yet, my son loved them! I was amazed that my son could understand the concept of play and his newly found skill at walking came in handy while he chased around the older kids. 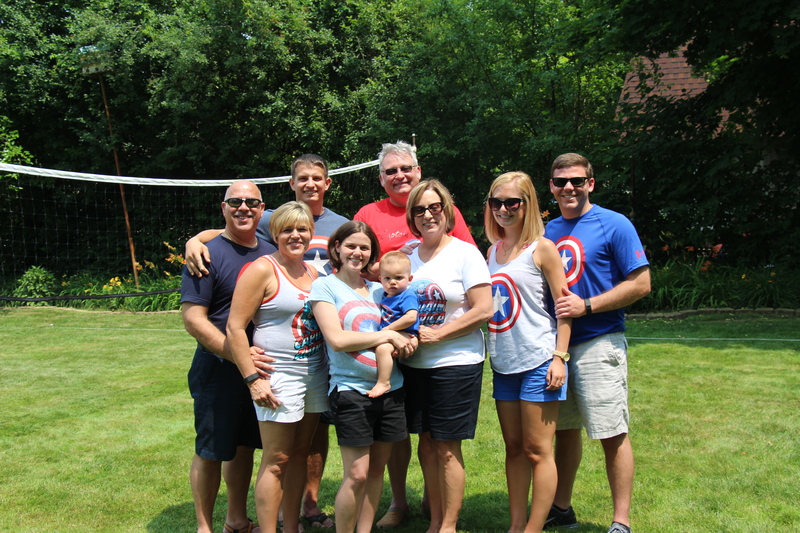 When my son was born the day before the Fourth I knew immediately that his first birthday would be Captain America themed! 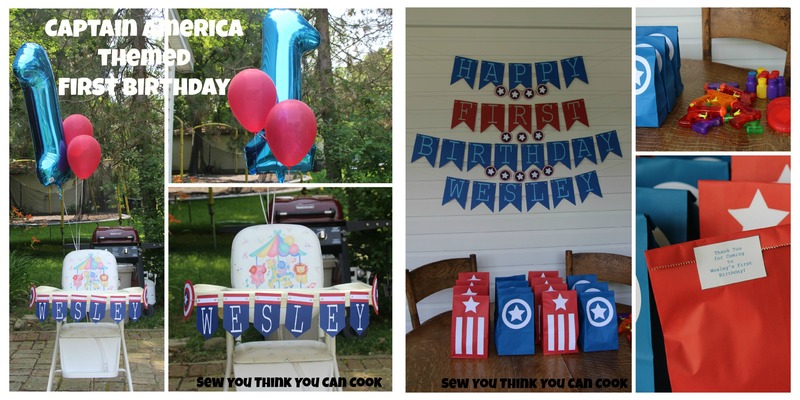 I had been pinning ideas for a whole year and could not be more thrilled with how successful his party turned out. 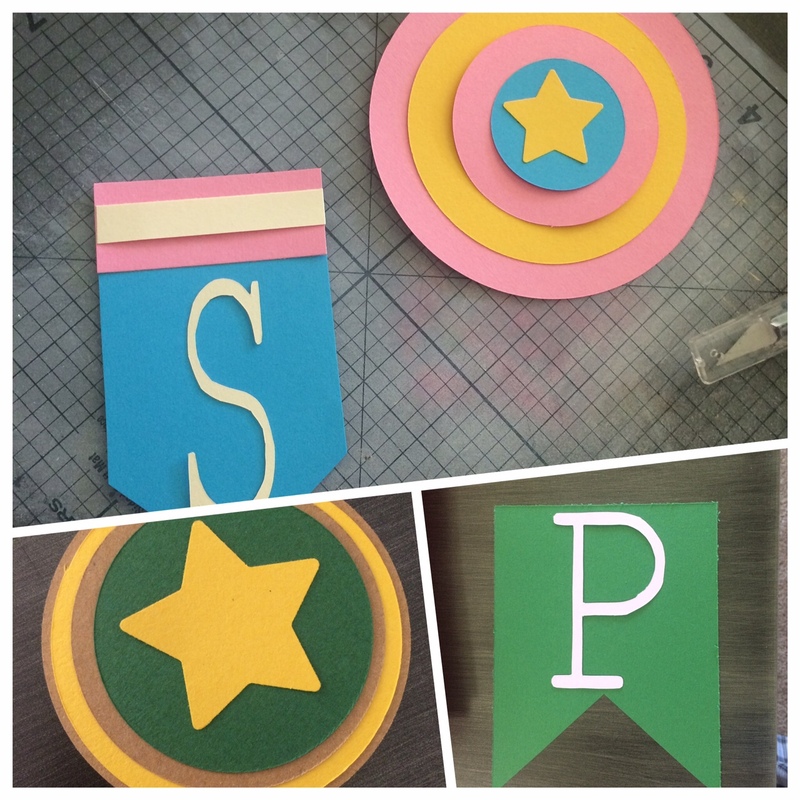 I couldn’t find any pre-made party decor that was only Captain America since the latest movie that was released was the Avengers. So we resorted to using red, white, and blue. I added pops of yellow to break up the monotony and keep it “comic-book-y”. I alternated red and white plates alongside alternating white and blue napkins. Blue dessert plates were used alongside red napkins. I cut stars out of white sticker paper with the help of a friend’s Silhouette Curio Cutting Tool , and placed them on blue cups. Two 16″ Patriotic Orbz Balloons were paired with yellow balloons and placed on either side of the food table. White stars were cut out from paper and I hand wrote the food labels in red or blue to be placed next to each dish. The party favor bags were simple paper bags in red and blue which I then decorated. The red ones received stars and vertical stripes, to mimic Captain America’s uniform. The blue ones received stars surrounded by a white circle, to mimic the shield. Sticker paper came to the rescue with this project, too! I sealed the bags with a “Thank You” sticker. Inside the bags were two glow sticks (red, white, or blue), a squirt gun, small frisbee, bubbles, and some candy. The extras were offered beside the bags for any older “kids” who might want to play. 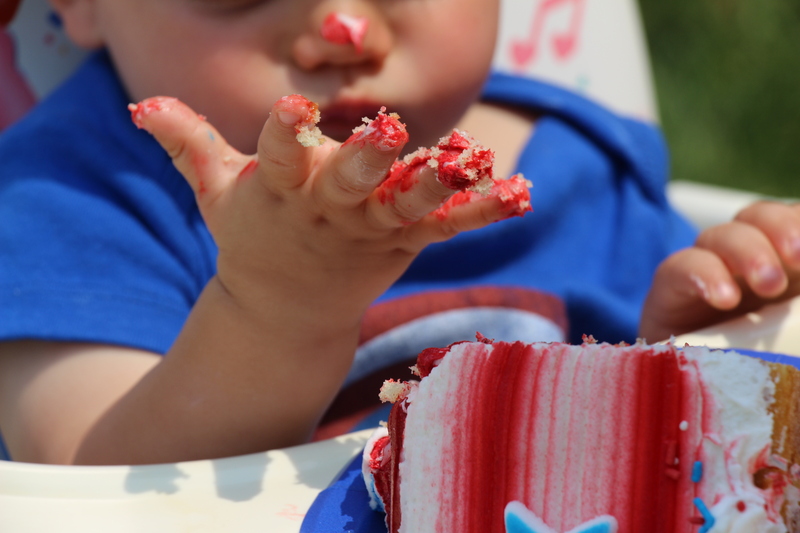 The high chair, where the little man would have his slice of cake, was decorated with a giant blue number 1 and two red balloons. On the front of the high chair tray I created a banner consisting of his name book-ended by two Captain America shields. My biggest project was creating the big “Happy Birthday” banner. It ended up being displayed behind the goodie bags inside. I found inspiration for both banners on Pinterest. For the highchair banner I used the shape tool in Microsoft Word for the pentagon template at 2.9″x 5″. The font used is Simplified Arabic Fixed. I placed my son’s name in WordArt at font size 96 then sized the WordArt graphic to be 3.08″ x 8.03″ and then selected Rotate Flip Horizontal so that the text would be backwards. Everything was printed on cardstock and cut out using a craft knife. I used small glue dots to adhere the letters to the pentagon. I then cut the red and white cardstock to fit and glued those in place on top of the pentagon. For the “Happy Birthday” banner I used this template and printed on red and blue cardstock. The letters used the same font as the previous banner and followed the same method. Only three letters at a time at font size 96 were placed in a WordArt graphic. The graphics were formatted to 3.67″ x 8.75″. A grey cardstock was used for “first” and placed on the red flags while a lighter blue was placed on the blue flags. And now for the important part of the party: The Food! The main course was broasted chicken from a local favorite chicken place along with their cole slaw, mashed potatoes and gravy, and cinnamon rolls. Because they’re my husband’s favorite, I doubled my recipe for Cherry Chipotle Baked Beans – and there wasn’t any left! Doubling the recipe requires double the time so I made them Wednesday and reheated them before setting the slow cooker on low on the food table. The dish I’m surprised to say got the most reviews was my Buffalo Macaroni Salad! I tripled the amount of pasta, eyeballed the veggies, and doubled the dressing (however, I only halved the original amount of chili powder as the pasta salad only gets spicier the longer it sits). There was still dressing leftover and would be perfect for chopping up the leftover broasted chicken and creating a chicken salad. My mother-in-law made a 7-layer dip (which was devoured in under an hour) which I decorated using tomatoes and chopped black olives. To create the star in the center I placed a star shaped piece of paper in the center of the dip and traced around it with the olives. The key to getting that star to be recognizable is really concentrating the olives. To make a shield fruit tray I chose strawberries, blueberries, and mini marshmallows. I found a star shaped bowl at my favorite thrift store which was filled with a cream cheese and marshmallow dip (1 block of cream cheese + 1 jar of marshmallow creme). My mom didn’t have a platter large enough so we got a cheap 16″ pizza tray! 3 pints of strawberries, half a bag of mini marshmallows, an entire recipe of dip, and at least of pint of blueberries were demolished by happy party goers. 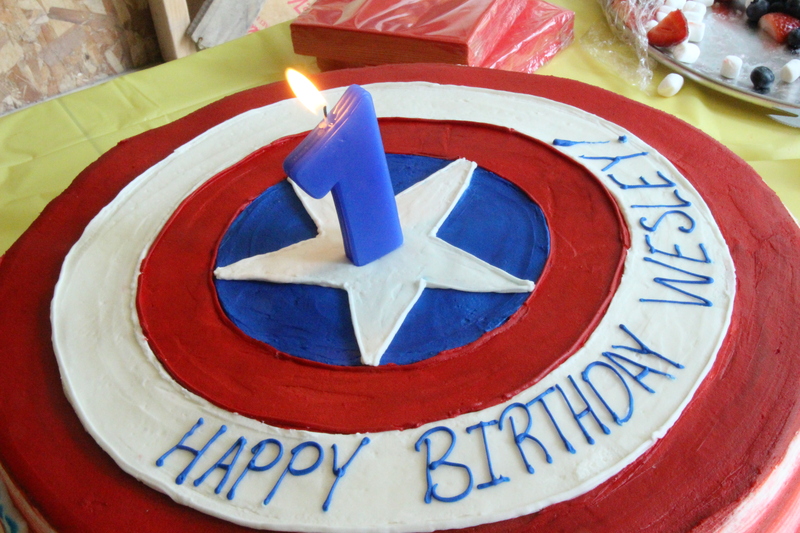 And of course the cake – a marble cake with strawberry filling and cream cheese icing, decorated to look like Captain America’s shield. My little man was very hesitant when it came to the cake but once my mom fed him a bite his interest was piqued. (My husband put that bit of frosting on his nose.) Fun fact: red frosting dyes hands and faces! It did wash out of his Captain America onesie just fine, though. < Previous Old Glory – completed! Absolutely love the last photo! Everything looks wonderful!